With this new model, Rio industries has achieved a day cruiser generous in living space and useful solutions to the life on board. 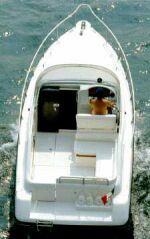 With a register length of 7,5 meters only, the boat is in reality one meter longer, to the full advantage of cockpit and underdeck spaces. 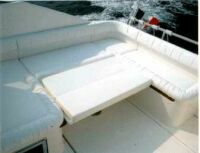 The new 850 Cruiser has a very spacious cockpit incorporating a "U" shaped dinette, convertible into a sun-lounge on the starboard side, and a wide passage on the port connecting the comfortable swimming-platform to the main cabin hatch. 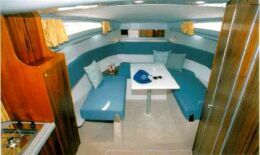 Below deck simplicity and fittings accuracy are the main characteristics: forward the dinette can be converted into a real comfortable double bed by the simple rotation of the two side settees. On the port side the galley area has a nice looking anti-shock material, incorporating the sink. 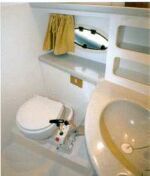 The toilet space is located on the starboard side and is fitted with sink. shower and lockers. 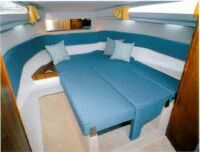 It has a practical two door access, one leading to the galley, the other to the aft guest cabin. The latter is particularly well conceived with full size entrance, lockers and a double bed with a sliding porthole to the cockpit guaranteeing plenty of light and air. 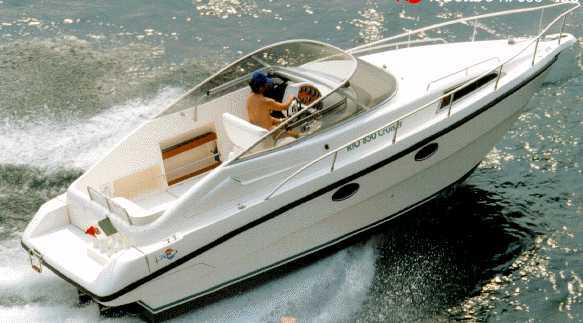 The craft on trial was fitted with twin 145 hp out-drives which are the basic engine option; they are also the right choice, price wise and are sufficient to guarantee a 30 knots top speed. Liferaft compartment; anchor with chain and rope; antifoulding; stern davits foundations; engines and auxiliary batteries; tool bag; stainless steel bow roller and beak; pilot seat; cockpit shower; fuel line electrovalve; cabin and cockpit fire extinguishers; stern and bow towing brackets; pressurized water plant; engine room noise insulation; galley with stove and refrigerator; windshield; swimming platform with ladder and door to the cockpit; electric / manual bilge pump; self drain cockpit; magnetotermic switches on main electrical board; stainless steel water and fuel tanks; engine instruments; hydraulic steering gear; horn. safety equipment; cockpit tarpaulin; battery charger with shore line; engine running hours counter; forward sun pad; shower (in the toilet); depth sounder; search light; davits; cradle; GPS Pan Navigator; Loran; liferaft; gangway; forward hatch; fishing rod and boom holders; stereo; VHF; electric windlass with chain; watertight tarpaulin; sunshade tarpaulin. 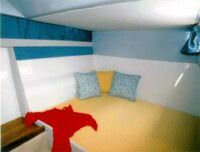 Interiors: roomy convertible forward cabin; coordinate fabrics and upholstery; dinette; moquette covered cabin sole and sky lined ceiling; marine plywood doors and bulkheads; dimmer lights.